Mozart composed La clemenza di Tito for the coronation of Leopold II as King of Bohemia in September 1791. He had then written most of the score for Die Zauberflöte but had to put it aside temporarily. He then finished Tito in eighteen days, assuredly only the musical numbers (overture and 26 vocal numbers), while the recitatives were left to somebody else to design, probably his pupil Süssmayr. The libretto that was presented to Mozart was an old one by Metastasio, which had already been set by almost 40 composers. It was revised and modernized by Caterino Mazzolà, who also reduced the original three-act structure to two. Whether the king liked it is not known but his wife reportedly dismissed it as “a German mess”. It became popular, however, and was, at the beginning of the 19th century, the most frequently performed of his operas. As was customary in those days, though, it was subjected to changes, arias substituted with newly written ones. The present recording is an example of this practice. It is a reconstruction of a production of the opera at the Wiener Hoftheater in 1804, where Joseph Weigl (1766 – 1846), a former pupil of Salieri, replaced all of Tito’s arias with compositions by himself and in one case Simon Mayr. Weigl, who had worked with Mozart, was reverential towards the original and “even used thematic elements from Mozart to vouchsafe a certain continuity”, as conductor Alessandro De Marchi says, while Mayr’s contribution “is pure bel canto”. There is no denying that this aria sticks out. It requires both virtuoso singing and dramatic intensity, in particular in the martial second half, which is a dialogue between Tito and the chorus. In the first part one can, as usual savour Mayr’s exquisite instrumentation with characteristically telling writing for the woodwind. 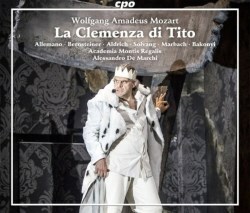 Carlo Allemano does an impressive job in this aria and the ovations are well-deserved. Another “novelty” in this recording is the accompaniments to the secco recitatives, traditionally allotted to a harpsichord or a fortepiano but here played by a cello with a double bass playing the bottom line. This seems to have been quite common during this period, according to research, and it works well in this opera. The present recording was made during four performances in Innsbruck in August 2013. It is well-balanced and the extraneous noises that are more or less unavoidable in live recordings don’t detract from the enjoyment of the performance. During the last 10–15 years we have learnt to live with this problem, and truth is that we often get more involved in the performance than when listening to a perfect but sometimes clinical studio recording. The orchestra Academia Montis Regalis, was founded in 1994 with the ‘goal of presenting a repertoire from the seventeenth and eighteenth centuries according to historical criteria and by using original instruments.’ Judging from various photos of the ensemble I conclude that for this production the body of strings was substantially amended. No fewer than 28 string-players are listed in the booklet. The playing is crisp and the sound is well integrated. The 23-strong chorus is also excellent. Both ensembles have worked with Alessandro De Marchi for several years and so close a relation pays dividends. This and the live occasion contribute to a taut and engaging performance. The solo singing is also on a high level. Nina Bernsteiner as Vitellia impresses greatly with her virtuoso coloratura and the beauty of her voice. Kate Aldrich, the best-known member of the cast, in the role created for castrato Domenico Bedini, is also grandiose. Her aria Parto, ma tu ben mio with clarinet obbligato (CD 1 tr. 22) is a true highlight. Carlo Allemano in the title role is slightly dry of voice but he is an engaged actor and he negotiates the florid singing, for instance in Al rimirar l’oppressa (CD 1 tr. 20), possibly by Weigl, with panache. I must admit that this and the other replacement arias are attractive, even though one feels a bit disoriented when one is used to Mozart’s original. Norwegian mezzo-soprano Ann-Beth Solvang is excellent in the trouser-role as Annio. Dana Marbach’s Servilia is also good while Marcell Bakonyi’s Publio is a worthy role-assumption. This recording is so special that it can’t be quite comparable to the numerous excellent recordings already on the market. Kertesz (Decca), Colin Davis (Philips), Böhm (DG) and Mackerras (also DG) can be warmly recommended to those who want the original. There are others as well that I don’t have but for those who are well-stocked with Tito recordings and/or a bit adventurous and want to experience what it must have sounded like at the Wiener Hoftheater back in 1804, this is a very interesting proposition.